24 Jun Battambang, Bats and Bikes! Written, one paragraph a piece, by the OG Southeast Asia: Cities and Sanctuaries team The tuk tuks, trucks, bicycles, motorcycles and cars whizzed by at dizzying speeds as we reentered city life, but this time in Phnom Penh. After days spent under wide-open skies and the hot sun in Battambang, we realized how quickly we slipped into the casual speed of rural life as the hustle and bustle of urban life took us by surprise. 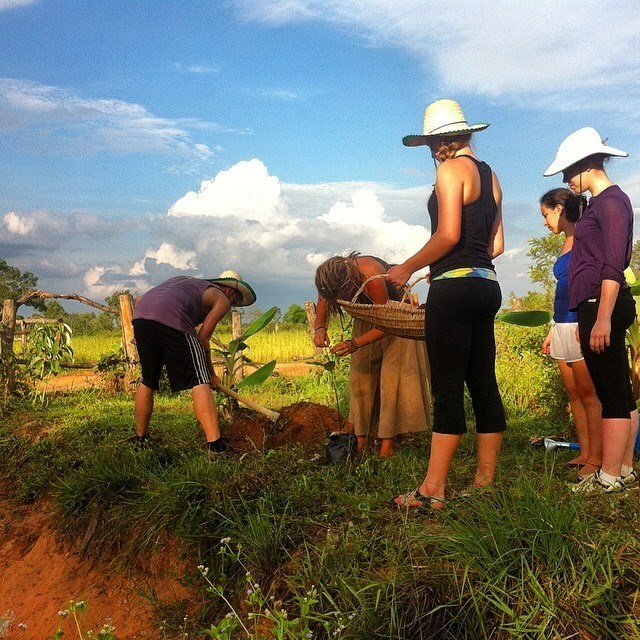 How can we sum up our time in Battambang? Soccer in the rain. Soccer in the rain… Ummm soccer in the monsoon rain with monk children? Does it really get any better than that? 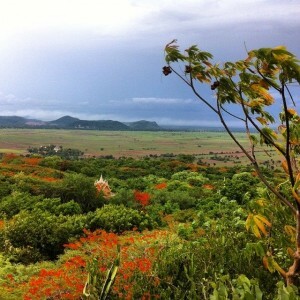 Not really, but we’ll try to elaborate a bit more about our time in Battambang and the Teuk Poh Permaculture Farm. 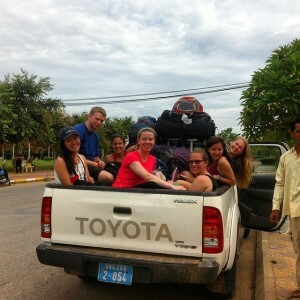 Piling into the back of a pick up truck, we rolled further into the lush green countryside. Embracing the SEA karaoke culture, we sang songs and entertained the shocked, but humored locals as we passed. The Permaculture Farm was waiting with open arms for our arrival to spend the next few days with them at the educational training center. The permaculture farm took on the form of a holistic system that gave a glimpse at solutions of sustainability that otherwise consume urban as well as developing rural spaces. A dusty dirt dwelling that once housed a small herd of cows and a large family of six has now evolved into a modest sprawl of houses and tree nurseries, ponds and gardens that offer new ecosystems a place to thrive and coexist with local families as well as visitors such as ourselves. Local Cambodian farmers frequent this farm and learn different ways to utilize their land and sustain their livelihood, in a way that is mindful of their environment. The farm is situated at the foot of a mountain and capitalizes on the natural downward flow of water to fill reserves and feed its gardens. Waste takes on the form of compost and biogas to fertilize and maintain its many ecosystems. We built a new sanctuary for mango, coconut and jackfruit trees, as well as some raised garden beds out of bamboo. Planting beans and seeds that served the multipurpose of maintaining the structure of embankments as well as providing food. We learned so much about sustainability and how as the climate will change in Cambodia the farmers will need to change their practices to maintain a livelihood. But it wasn’t all just learning. The first night we arrived we travelled to a coconut farm to pick up a few trees. While there we were treated to a few Cambodian deserts of sticky-rice in banana leaves and ice cream coconuts. The next morning was memorable as we hiked up the nearby mountain and explored the opening of a Khmer Rouge hideout cave. Bonfires happened the last two nights there with tribal dancing and shirt-dyeing bandana sacrificing. Becoming good friends with dreadlock sprouting Sam, who originally hails from California, was definitely a highlight. Learning all her permaculture and eco-wisdom was wonderful and made some of us think twice about our admissions that we could never be vegetarian. Well… the girls at least. 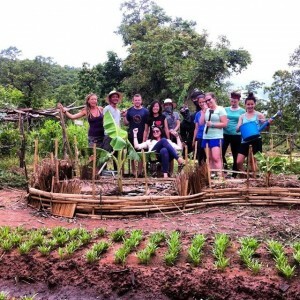 The permaculture farm was definitely a hit with us! Though as we left to head to Battambang we were glad to leave the traditional Cambodian bamboo beds, buckets showers, squat toilets, and burning heat behind. The riverside city of Battambong was far less focused on the Western tourists that were found in the streets of Siem Reap. It was there that we saw a circus show, fish factory, countryside bike ride, as well as a flight of bats against the skyline of killing caves. We had the chance to meet our trip leader Samnang’s family too! They were warm, welcoming and greeted us with a familiar smile and delicious local lunch at their home. We took a stroll through the rice fields and witnessed a Skype reunion between the local elders of the village, Samnang’s mom and her siblings. After 35 years of separation caused by civil war, this was the first time they had spoken and seen each other in real time. The circus blew our minds! The bats made us feel like we were in a National Geographic episode. The fish factory rocked our sense of smell. Above all, the Killing Caves reminded us of how far these amazing people have come. The Skype reunion filled us all with happiness and hope. One experience after another, we delve deeper and deeper into the rich culture offered in Cambodia. Next up, Phnom Penh!